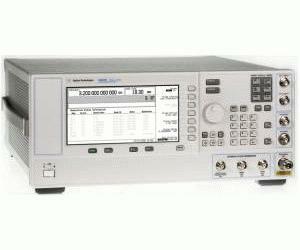 The E8663B analog signal generator provides lowest close-to-carrier phase noise of the industry available in an off-the-shelf signal generator. Option 503 is required for signal generation applications that call for carrier frequencies at or below 3.2 GHz. Common uses include low noise reference applications, signal simulation for radar and electronic warfare systems, and satellite communication system evaluation.